Swimmer's ear is an inflammation or infection of the outer ear canal. It usually gets better quickly with treatment and there are several things you can do to prevent swimmer's ear. Swimmer's ear, also called otitis externa or tropical ear, is usually caused by a bacterial infection. You are more likely to get swimmer's ear if you regularly get water in your ear, such as when you go swimming. A wet ear canal makes it easier to get infected. Your risk increases if the water is not clean. Swimmer's ear can also develop if you have a fungal infection or an allergic reaction to something in your ears, such as ear plugs, medication or shampoo. The ear canal might look red and swollen. You might also have a discharge, which can look clear and watery or can look like pus. In the longer term, your hearing might be affected if you have a build-up of dry skin in your ear canal. See your doctor if you think you might have swimmer's ear. Your doctor will probably examine your ear canal and tympanic membrane to ensure it is not damaged or torn. Your doctor will usually prescribe medicated ear drops. If possible, get someone to apply the ear drops for you - it is easier than trying to do it yourself. In most cases, treatment will improve symptoms within 1 to 3 days. Most people will have few to no symptoms by the end of the first week of treatment. If your symptoms haven't improved by then, see your doctor. avoid scratching or touching your ear. not trying to remove earwax since it can protect against infection. 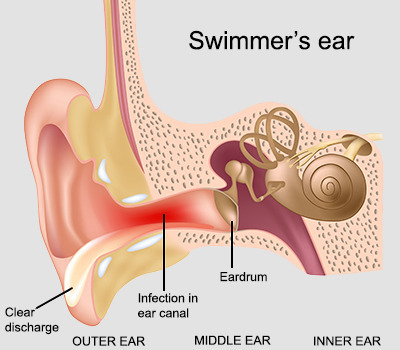 Swimmer's ear - an infection of the outer ear canal - occurs when the skin lining the ear canal is wet for long periods.